A contusion is a bump that happens under the skin after an injury. This bump is caused when fluid collects under the skin. A hematoma is also a bump that happens under the skin after an injury. But this bump is caused by blood that collects under the skin. Each can be called a bruise. Bruises occur when blood is released from the capillaries and is trapped under the skin. The good news is that by the time you notice a bruise, it’s already well on its way to healing. A bruise is commonly tender and sometimes even painful for the first few days, but the pain usually goes away as the color fades. Because the skin is not broken in a bruise as with a scrape or cut there is no risk of infection. Bruises typically take 2 weeks to heal/disappear. Initially, a fresh bruise may actually be reddish. It will then turn blue or dark purple within a few hours, then yellow or green as it heals. It is the hemoglobin in the red blood cells and the breakdown products of the hemoglobin that cause the coloration seen in bruises as they age. Although bruises may appear black (as in a ‘black eye’), the blood is never really black, rather it is a dark purple and green. Most of the color seen in bruises is due to the biochemical breakdown of hemoglobin, the oxygen-carrying component of blood (white blood cells are removing the decayed blood products little by little). Different components of the blood have different colors, and these colors in turn lend color to the bruise. There are two major breakdown products that can lead to visible color in a bruise. 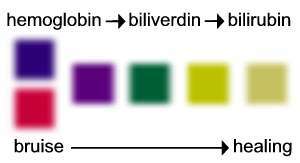 These are a green pigment called biliverdin and a yellow-brown pigment called bilirubin. Bruises usually start out as a dark blue or crimson; fade to violet, green, and dark yellow; then turn a pale yellow; finally disappearing completely. The color change begins either at the outside of the bruise or at the center, depending on how the bruise occurred. The closer the broken blood vessels are to the surface, the sooner the bruise appears and the more intense its colors will be. Most small bruises disappear within seven days, and larger ones go away within two weeks. Bruises may last longer in elderly people, because restricted circulation slows the removal of the decaying blood components (this may be particularly true in the lower extremities, where circulation may be restricted due to clogging of the arteries). [generic: warfarin], Dicumarol, Miradon) or aspirin, which interfere with clotting. If the blood doesn’t clot properly, more of it will leak out under the skin when trauma occurs. The treatment for a bruise is most effective when instituted immediately. To treat a bruise, the first step is to apply ice (icepack or a bag of frozen peas). You can do this on an interim basis for not more than 15 minutes at a time. Do not apply ice directly to the skin. Wrap the icepack in a towel. This numbs the pain, reduces swelling and slows down the bleeding. Acetaminophen (Tylenol) or ibuprofen (Advil, Motrin) may be taken for pain as instructed on the bottle. Avoid aspirin because aspirin slows the blood from clotting and may, in fact, prolong the bleeding. After about 48 hours, heat in the form of a warm washcloth applied to the bruise for 10 minutes or so, 2 or 3 times a day will increase circulation to the bruised area allowing the skin to reabsorb the blood more quickly. Ultimately, the bruise will fade. If the pain worsens; the pain should lessen with time. The bruise is accompanied by swelling and extreme pain, especially if you take a blood-thinning medication for a medical condition. A bruise does not improve within 2 weeks or fails to completely clear after 3 or 4 weeks.